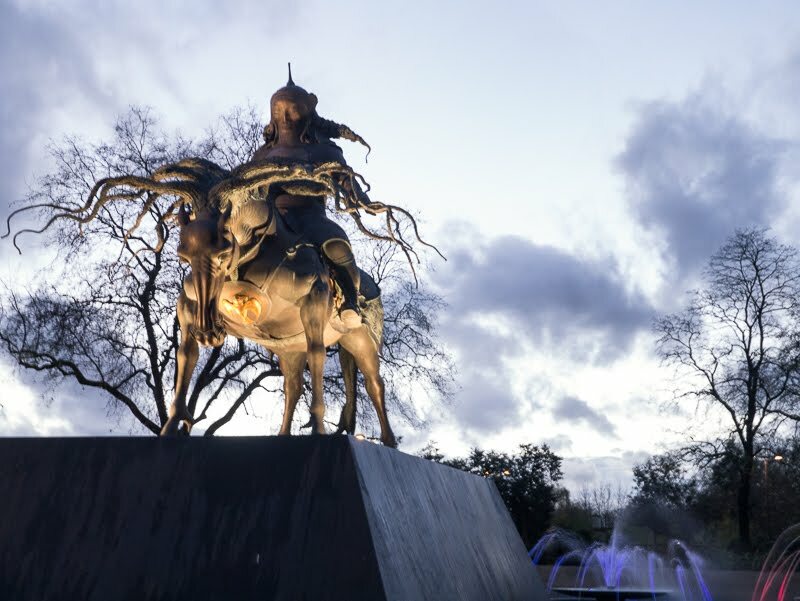 Genghis Khan on his horse looks even more scary as night falls. The five metre statue at Marble Arch, is the work of Russian sculptor DashiNamdakov, who comes from a small village close to where the Mongol Nomadic tribes ruled. He says of this sculpture that he is showing the great Genghis Khan as a thinker not a warrior. I think I would be getting out of his way pretty quickly if I was confronted with intellect like this. Very good shot of a not very nice man. Had he bothered to continue into Europe the world may have been a different place! It must be very hard to take the "warrior" out of him because I think I still see it. A most interesting sculpture. An amazing mind and and amazing human being. This is on my list for my next visit. Convenient location, too. Next time I'm passing by Marble Arch I'll definitely look out for this sculpture. It is highly distinctive!